The future skills gap has brought learning and development into focus as a top business issue. In the Deloitte Global Human Trends 2015, only 28% of participants indicated they were ready to take on their workforce challenges. Eighty-five percent of participants said learning is “important” or “very important,” but only 46% described their organization as ready to take on the issue. From our perspective, the primary reaction has been an investment in technology. Learning technology investment is growing at over 25% per year and shows no sign of slowing down. New e-learning capabilities are making learning easier to manage and more effective. However, we maintain that technology alone is not the answer. The real challenge today is to align service delivery with organizational objectives and measure the impact on the business. “39% of L&D professionals were not confident that their learning initiatives actually supported the skills that the business needs. Only 55% analyze the business problem before recommending a solution. 36% of organizations work with business leaders to identify business performance indicators that they want to improve.” (Aligning Learning to business). TowardsMaturity.org. 2015). 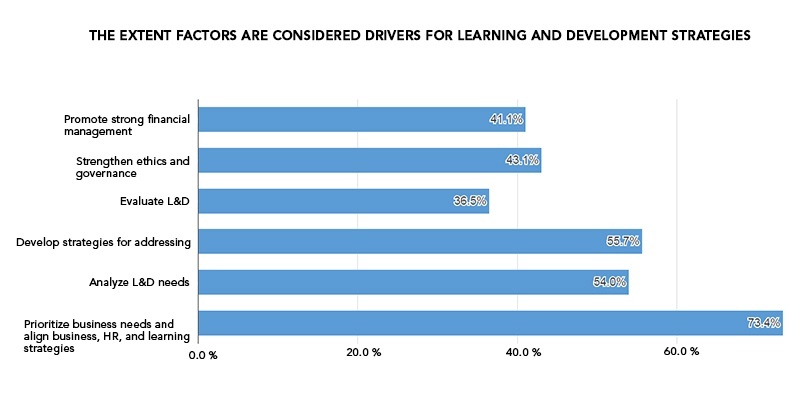 The Brandon Hall Group’s 2014 benchmarking study indicates real progress but shows Learning and Development has a long way to go. C-Suite leadership. 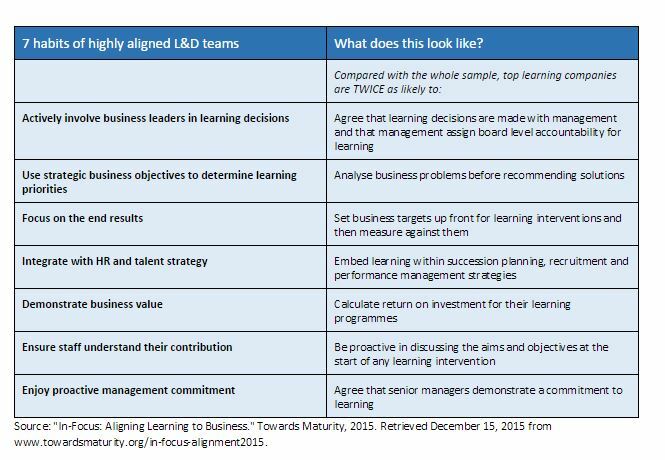 The evidence in the study shows that in high-performing learning organizations, the CEO sets the L&D strategy. Social Learning. Actually, social is only one part of a complete learning experience. e-Learning makes it cost-effective to provide a continuum of activities over multiple channels, over time, to support performance. Measuring the impact of learning. Standard Kirkpatrick Level 1 measures are no longer enough. We need to correlate efficiency and effectiveness measures with business results. Total Integration with talent management. Integrating learning with onboarding, performance management, goal management, and succession planning is now an essential function of human capital management technology. Over the next few weeks, we will address these issues with a six-step structured approach to alignment, management, and measurement. Whether this is a review or your first foray into strategy and analytics, we hope you will find our discussion helpful. We look forward to giving you the next installment in our series. Go with us on our journey to quantifiable business impact and a stronger strategic partnership. 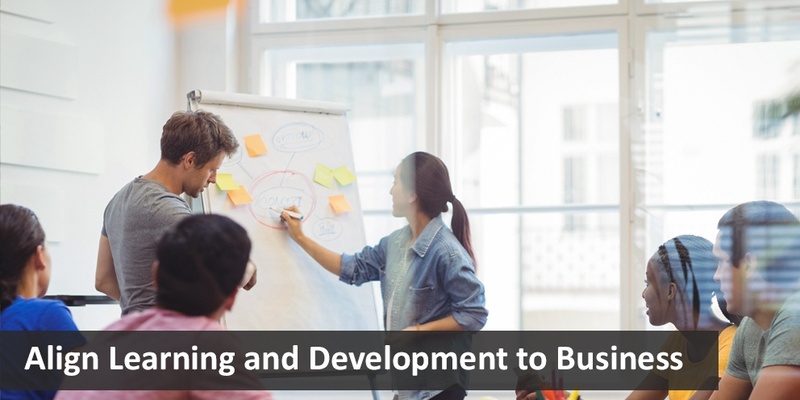 This article is the second of a seven-part series on becoming a strategic partner by aligning learning and development with business objectives. The introduction discussed the argument for aligning learning programs with organizational goals and measuring outcomes. The skills gap has leaders turning to training and development as a solution, but they want to see the return on investment. Aligning L&D with strategic objectives is essential, and you must be able to show a direct link to business results. Preparation for becoming a strategic partner begins with understanding the business; you are preparing for discussions with business people about what they do. It is more than understanding how the business works. You need to speak their language. Aligning with objectives begins with knowledge of the business. Start with a scan of the industry in which it operates. Scanning the industry environment has two benefits: understanding the external pressures business leaders face, and knowing the dynamics of your extended enterprise – customers, suppliers, and distribution channels. You can be much more helpful in your discussion with business leaders when you know the challenges they face. Review your company’s SWOT analysis or strategic planning documents and talk with strategic planners to refresh your knowledge of the competitive landscape. Consider also the needs of your extended enterprise. Even if you are not currently extending learning outside your organization, it is something you need in your portfolio of potential solutions. We find that companies that extend learning to people outside their organizations perform better than those who do not. Many companies are improving customer satisfaction and loyalty with extended enterprise learning. Businesses are also reaping benefits from extending learning to their suppliers and distribution channel. We recently helped a large auto dealer increase its sales by providing extended learning to dealerships, so the sales force had the latest information on new products. Now we turn our attention inward to refresh our understanding of how your company operates in its competitive environment. Seek out the people who do your strategic planning to review your organization’s purpose and the strategies for achieving it. Don’t neglect company culture. It is the framework for understanding how people interact to get things done. It will be helpful in determining whom you approach and how you frame your discussions. Next, we turn our attention inward to how your various business functions support strategic objectives. Review the hierarchy of objectives in the strategic plan and begin preparing for discussions about how learning supports your organization’s objectives. This article is the third of a seven-part series on becoming a strategic partner by aligning learning and development with business objectives. In the previous article we discussed how to analyze and understand the competitive business environment and the company’s purpose, strategy and culture. In this step will look inward to the learning portfolio. Any strategic initiative requires a rigorous assessment of the current situation. For our alignment project, we conduct a thorough review of current offerings and how they support business objectives. NOTE: When we discuss tracking and analysis in this series, we talk about using simple spreadsheets. You may have a learning management system or sophisticated tools that contains all the information you need. You may already be doing many of the things we recommend. If so, chime in by commenting to share your experience and expertise. The first group of programs you will want to assess will be those that have a direct impact on objectives or goals. You will evaluate indirect impact later in this step. Rearrange your worksheet as a list of objectives. The result is the foundation for an analysis of the direct business impact of learning. Don’t be concerned about being wrong in your estimates. You will work with goal sponsors to refine your estimates. What is most important at this point is that you identify the activities that have a direct impact.Impact on Goal is your estimate of the much the learning program contributes to the goal. For example, if the goal is a 10% increase and you estimate the learning has a 30% impact, you can estimate 3%. Programs that are not required and do not support a goal either directly or indirectly may be considered by candidates for elimination. Goals or objectives that do not have learning programs associated with them may be opportunities. If a learning intervention would help, these are items you may want to discuss with the sponsor. 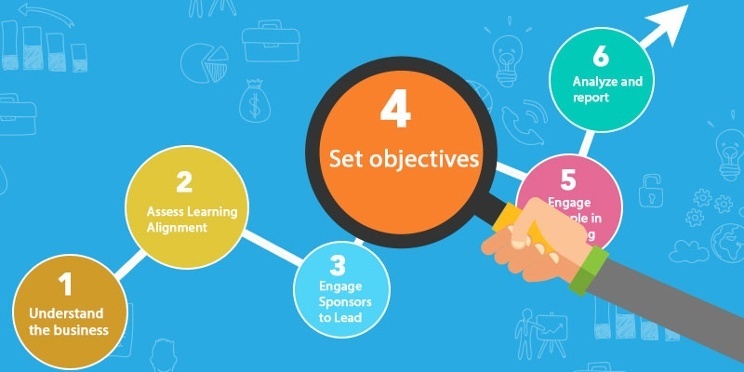 This article is the fourth in a seven-part series on becoming a strategic partner by aligning learning and development with business objectives. In the previous article we discussed how to assess the current state of the business impact of learning. In this step, will engage business leaders to sponsor their learning initiatives. Sponsors are the leaders responsible for business objectives. You will be asking them to participate with you in identifying and deploying programs that will help them meet their goals. They can be at any level of the organization, but they must have the authority to control the resources needed to achieve their objectives. 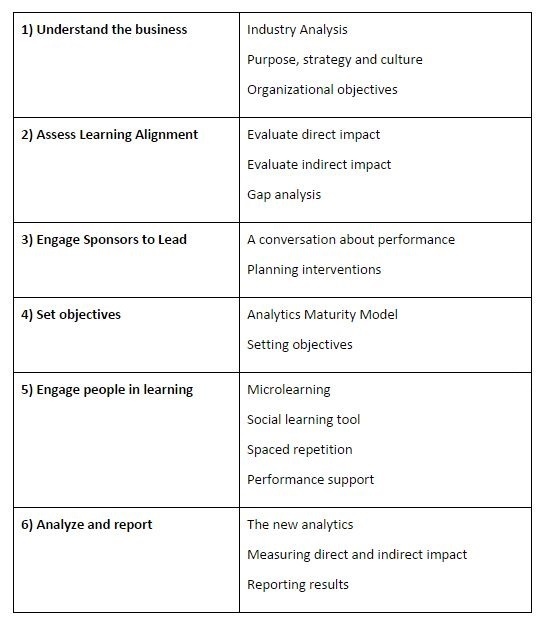 In Step 2 we evaluated learning programs and estimated their impact on business goals. We also listed programs that support strategic or other objectives. Then we assessed the gaps where goals do not have programs supporting them but might need intervention. Now we begin forging the partnerships what will carry us toward full alignment. Armed with the assessment of your learning programs and your new purpose, begin meeting with the business leaders who will help you drive your new initiative. Your purpose is to form a partnership with you in a consultant role. You will do that by understanding their challenges and their perception of how learning programs can help. Explain your purpose and how you are planning an initiative to use alignment, measurement and management to align your efforts with the business. Explain that your initiative is not about you – it is about them and their objectives. Get feedback on the sponsor’s perception of current learning performance and impact on objectives. Ask the sponsor to help you review the business impact of the existing activities you identified as aligned with the sponsor’s goals. Try to come to agreement on the impact. If the sponsor is receptive, explore areas where better knowledge and skills might impact performance. You now have agreement on metrics that will enable you to show the business results of your learning programs. You also have the possibility creating additional value. Your discussions revealed opportunities for learning interventions that directly impact the business. Now is the time to plan and execute the intervention as a real business partner. Position yourself as a consultant. You are creating an intervention for the sponsor’s goal, and you will want to establish the sponsor as the leader of the initiative. As with any project, you will define roles and responsibilities at the outset. The sponsor will most likely delegate the planning and design. As you are working with the people on the planning and design team, provide regular reports to the sponsor. In the next step, we will discuss the ways technology will enable you to create a multi-channel learning experience that will support participants until they are proficient. 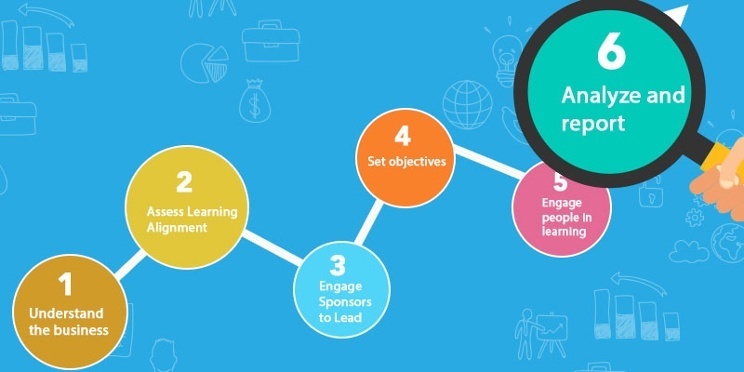 This article is the fifth in a seven-part series on becoming a strategic partner by aligning learning and development with business objectives. 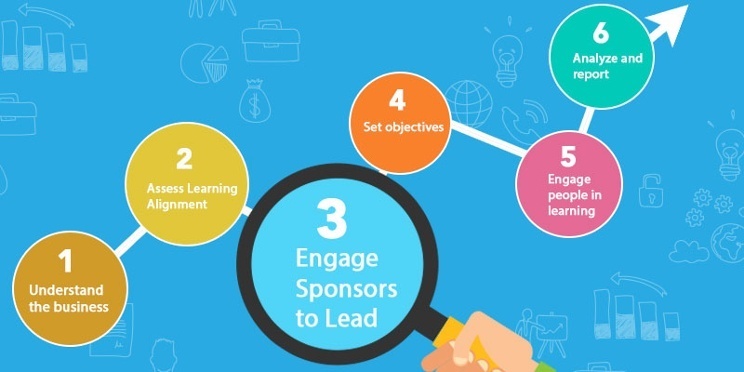 In the previous article, we explained how to work with business leaders to assess their needs and gain their sponsorship of learning programs. An essential activity in any project is setting objectives. We want to get a clear picture of our purpose and how we will measure success. Objectives will also keep us focused on what we need to accomplish. You and your sponsor define objectives to predict the impact your activities will have. Before we discuss setting goals, let us review the analytical tools available to learning practitioners. The tools you use to monitor and report your results will depend where you are in the Analytics Maturity Model . We have entered a new age of analytics in which automation and integration of talent management processes produce vast amounts of data. Until recently, turning the data into predictive intelligence has been a difficult and expensive endeavor, but technology has made analytics available to organizations of any size. When we met Jac Fitz-Enz, the father of HR analytics, about 30 years ago, he was encouraging us to learn how to capture information and analyze workforce trends. We needed to do this, he explained, to show how HR adds value to the business. We have grown beyond descriptive analytics (what happened) to the predictive analytics we are using today. He is now encouraging us to use prescriptive analytics to help us make the right decisions. We expect that prescriptive analytics and decision support will soon find their way into the mainstream of HR analytics. You don’t need advanced analytics to work through our six steps to a strategic business partnership. You can use simple spreadsheets. If you do have analytics capability, we recommend you use it to design and replicate your data collection and metrics. Contact an analytics consultant (like us). Contact your IT department for help. Become a member of the Center for Talent Reporting. Membership is not expensive, and you get all the tools and resources you need to manage your analysis reporting. Hire an expert (scarce in today’s labor market). 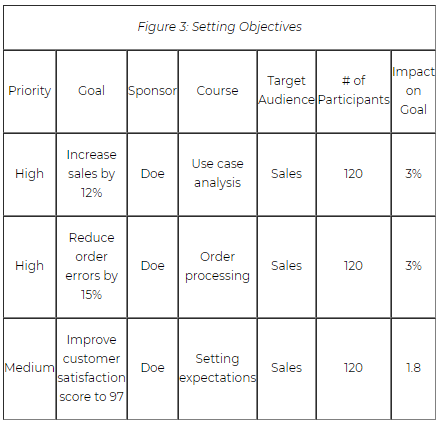 Use the worksheet you created to estimate your project’s impact on the sponsor’s objectives or goals. Your sponsor will have metrics for most objectives, and you can agree on the portion attributable to the learning intervention. 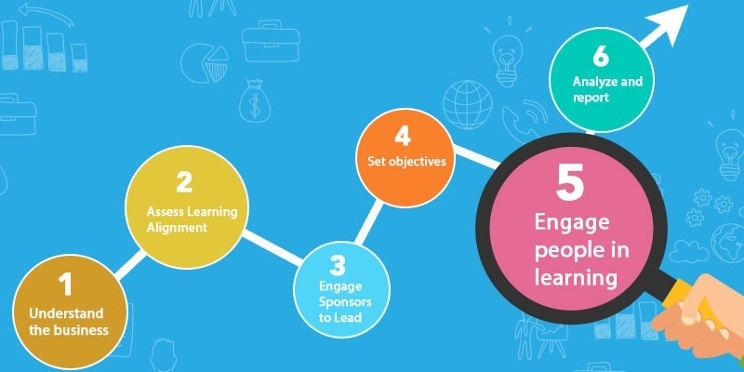 This article is the sixth in a seven-part series on becoming a strategic partner by aligning learning and development with business objectives. In the previous article we discussed how to work with sponsors to set goals for learning interventions. The sponsor’s involvement in planning and developing an intervention is essential to success. The sponsor is responsible for participation and performance, and will be interested in programs that provide continuous learning and performance support. Current e-learning technology makes that possible. There is a certain amount of irony in our previous statement. Technology makes new learning methods possible, but technology is an important component of the current skills gap. Almost one-third of workers in the U.S. say they are not proficient in using the technology tools they need at work. Only 10% say they have mastered them (Fernandez, Jeff. "How the 'Digital Skills Gap' Bleeds $1.3 Trillion a Year from US Businesses." Entrepreneur. July 7, 2014). We observed an instance where employees in a large local human resources department were clamoring for training in Microsoft Excel. Their new data analyst used Excel to create reports in minutes that took them days to complete, and they wanted to use the advanced tools to enhance their reporting. The analyst pointed the employees to the books and online resources he had used to learn his skills. Nothing happened. That experience taught the data analyst that most people won’t pursue learning – they want it delivered. The analyst had been assuming that everyone sought out new skills the way he did. Harvard Business Review gives us an interesting view of why employees don’t learn. They describe two “stances” that interfere with learning. The completion stance is one where employees want to get a task done with little or no mental investment. Learning in that stance is accidental. The performance stance is when people get a task done with a substantial mental investment but without reflecting on it for future use. It never reaches long-term memory. It would appear that the task ahead of us is to design learning programs in such a way they engage users and induce them to want to learn. New e-learning tools are helping us to do that. Two of our primary services are installing and supporting learning management systems and developing self-paced e-learning. We frequently use techniques that overcome resistance to learning, and we can make some recommendations that will be helpful in designing and delivering your learning. Microlearning. We have all seen training programs where everyone started the day attentive and enthusiastic. Then, by mid morning, they were checking their emails or finding excuses to step out of the room. Delivering e-learning in short bursts over time removes the pain. Microlearning is even more effective when content is interleaved to prevent the illusion of mastery created by repetition. Gamification. Using game mechanics to challenge and reward users is making training quicker, more engaging, and more effective. Interactive scenarios immerse users in the experience. Looped assessments that don’t allow users to exit until they get all the answers right focuses user attention. Reward systems and leader boards create competitive interest. Social learning tools. Providing the opportunity for people to learn from each other increases retention and creativity. Social learning includes more than connecting with each other. It includes collaboration on creating materials, sharing content, and e-learning courses that include interacting with others. Spaced repetition. Repeating content using a multi-channel approach helps overcome natural retention decay. Performance support. Short videos, online job aids, and quick reference guides help people quickly refresh their skills and knowledge on demand. All of the techniques we listed here can be used effectively in performance support. You will want the sponsor to take ownership of participation. It is important that the sponsor is fully invested in the design. The actual work will most likely be delegated, but you need the sponsor to sign off. This article is the last in a seven-part series on becoming a strategic partner by aligning learning and development with business objectives. In the previous article, we discussed training design and how to use micro-learning, gamification, and spaced repetition to increase learner engagement and improve retention. Participant ratings and feedback (Remember to account for rater bias. In your tracking sheet, add a column for the value of the goal achievement and calculate the value of the learning contribution. For indirectly supported goals, identify the improvement in the supported goal. If you can quantify a contribution to a financial result, use it. Be prepared to defend it. Include cost savings on e-learning. Identify and report on strong correlations between successful interventions and issues executives care about. 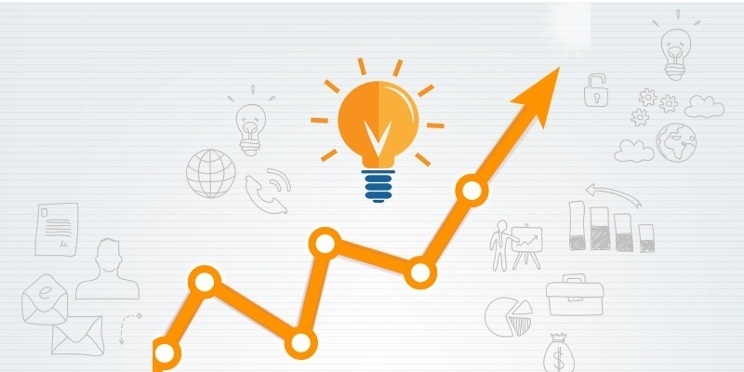 Identify improvements in quality measures, such as employee engagement and retention. Presenting the results to business leaders is about more than facts and figures. It is the story of how a strategic partnership improved business results. Gather intelligence on your audience and use it to shape the message. Start strong: purpose, clear direction, and expected result. Use time wisely. Leave time for discussion. Be flexible. Expect the audience to want skip back or move ahead. Be prepared with additional supporting data. Know the backstory. Introduce the characters. Make the sponsor the hero. You are the sidekick. Identify the need for intervention. Describe the solution chosen and why. Present the results, with the focus on financial results. One final tip: don’t give them a report at the beginning of the meeting. They’ll read it and leave. Our wish for you is that you create a strong partnership with your business operators, and can share the story of how your learning programs helped your company become a high-performing learning organization. We would like to hear about your successes. How have you aligned training and development to the business? What surprises did you encounter? What happened to employee engagement and productivity?